A seven-night, half-board holiday based for six of our seven nights at the delightful Hotel Porto Antigo, opposite the village of Mosteirô on the River Douro. All rooms in this small hotel overlook the lake created by the Carrapatelo Dam, a short distance downstream. From our base in Porto Antigo, we explore the Douro Valley by rail and by boat, with a trip on a steam train through some of the most beautiful scenery in Portugal, visits to wine cellars to taste their excellent wines, travelling the whole length of the Douro Valley railway line with a visit to a pre-historic rock art location and ending our holiday with a cruise down the River Douro to Porto. Our hotel has its own private marina, as well as a pool, gym, massage centre and a restaurant/bar. Monday 17 June Arrive at Porto Airport and transfer to your hotel. 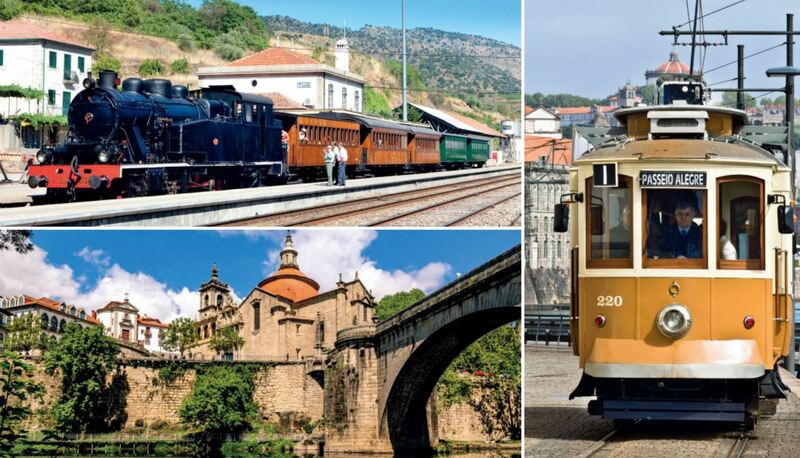 On Tuesday, catch the “Miradouro” train from Porto São Bento to Mosteirô for an early arrival at your hotel where you will be able to enjoy the facilities ahead of the arrival of the main group later in the day. 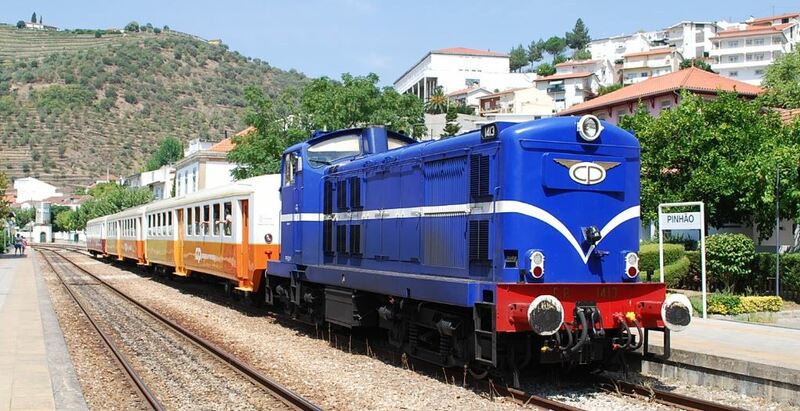 The Miradouro train is formed of refurbished 1940s Schindler carriages, hauled by an English Electric class 1400 diesel locomotive – as pictured above. Day 1 Tuesday 18 June (D) Our recommended group flight leaves Gatwick at 13.00. Direct flights also available from London Cirty, Stansted and Manchester and overland travel from St Pancras via the Eurostar. You will be met at Porto airport by David, your tour manager, and we will transfer to the Hotel Porto Antigo by coach. Dinner at the hotel. Day 2 Wednesday 19 June (B,L,D) Our first day in the Douro Valley takes us on a train from Mosteirô on the north bank of the river, to Covelinhas, just beyond the last big town of Regua. Here we find ourselves at Quinta das Murças, a wine cellar on the banks of the River Douro, and a chance to taste some of the regions excellent wines. Our visit will include a tour of the winery, where we hear how the wine is produced, a short cruise on the river on their very own boat, and a picnic lunch which will be accompanied by a small selection of Quinta das Murças’ wines. We return to Mosteirô by train, and after time to relax, we have dinner in the hotel. Day 3 Thursday 20 June (B,D) Returning to Mosteirô station, we head downstream to Portugal’s second city of Porto. Porto’s São Bento station is famous for its huge tiled pictures, depicting events in the country’s history. On arrival at São Bento station we have a historic tram to take us down to the well-known Ribeira district. A short walk over the lower part of the iconic two-level Dom Luis I bridge takes us to Vila Nova Gaia, where we find the cellars of all the famous Port Wine producers. Free time for lunch and your own exploration, before meeting up to visit one of these Port Wine producers, with a guided tour around the cellar and of course a chance to taste some of their excellent port wine. From here we catch a cable car to Jardim do Morro at the upper level of the Dom Luis I bridge, and after time to enjoy the stunning views, we take a short trip on a modern tram to São Bento station for our train back to Mosteirô and dinner in the hotel. Day 4 Friday 21 June (B,D) Today we take the train west to the lovely country station of Livração, the junction station of the now-closed metre-gauge Tâmega Line. From here we transfer by road to the pretty riverside town of Amarante, one of the gems of northern Portugal. Here rows of 17th-century mansions with their brightly painted balconies line the narrow streets. There will be time to visit the Monastery and other sites during our walk through the town. After lunch we join our coach for the short journey to the vineyards at Quinta da Aveleda, one of the region’s top Vinho Verde estates with its fine gardens. Our coach will drop us back at Penafiel station for our rail journey back to Mosteirô. Dinner in the hotel. Day 5 Saturday 22 June (B,D) This morning we catch a train to Régua. Régua is the centre of the Port Wine industry and a visit to the excellent Douro Museum is recommended. In the afternoon, we join a restored steam-hauled vintage train, formed of five wooden bodied carriages dating from the 1920s. We travel up the river through breath-taking scenery of terrace vineyards and olive trees, to the riverside station at Tua (about a 90-minute run). En-route we stop for water at the picturesque riverside town of Pinhão. Use the time here to see the famous tiled pictures, dating from 1938, that decorate the station. Many of the most famous names in port production have quintas (port lodges) close to the railway station which is decorated with dazzling tile panels depicting scenes from bygone days of port production. On board, we are treated to traditional singing and served local delicacies and port wine. After a break, we return on the steam hauled special to Regua, and our connection back to Mosteirô in time for dinner in the hotel. Day 6 Sunday 23 June (B,D) In the morning we catch the regional train east along the river to the railway’s terminus at Pocinho. Until the late 1980s the main line continued to the Spanish border at Barca d’Alva and at Pocinho, the Sabor narrow gauge line branched off. You can still see a steam loco from that line that was abandoned in Pocinho when the line closed. Day 7 Monday 24 June (B,L) One of the highlights of the holiday, we sail down the River Douro to Porto. We pass through two dams, firstly the spectacular Carrapatelo Dam. The lock in this dam will take us down 35 metres, one of the deepest locks in Western Europe and an unforgettable experience. Later we pass through the relatively small Crestuma-Lever Dam, as we start to see more settlements and finally the city of Porto. The approach to Porto is spectacular as we pass under a series of bridges, including the iconic Maria Pia railway bridge and the Dom Luis I two-level bridge that we crossed on foot and by tram earlier in the holiday. After docking we will make the short journey to our hotel at the airport, ready for our flights home tomorrow. Our farewell lunch, including drinks, will be on board our river cruiser. Day 8 Tuesday 25 June (B) We are just a short walk from the airport. If you have later flights, you may wish to catch the modern metro into Porto and explore a little more of this fascinating city. This tour has some walking, including hills and steps. Some Portuguese railway stations still have low platforms. In Porto you will need to be able to walk a few hundred metres.